One of the most rewarding feelings when travelling is coming across off the beaten path places. Therefore we wanted to share the lesser known destinations to have outdoor adventures in Lithuania and show you how entertaining this Baltic country can be. If you are thinking where in the world is Lithuania, it is in northern Europe. Bordering its two Baltic neighbours Latvia and Estonia, Lithuania remains fairly undiscovered by many. And that's a great thing, right! It gives us of all the opportunity to discover new surroundings and have some fun along the way. So here goes the list of top 5 active experiences in Lithuania, handpicked for you. It would be a crime to miss the legendary castle sitting in the middle of the lake. 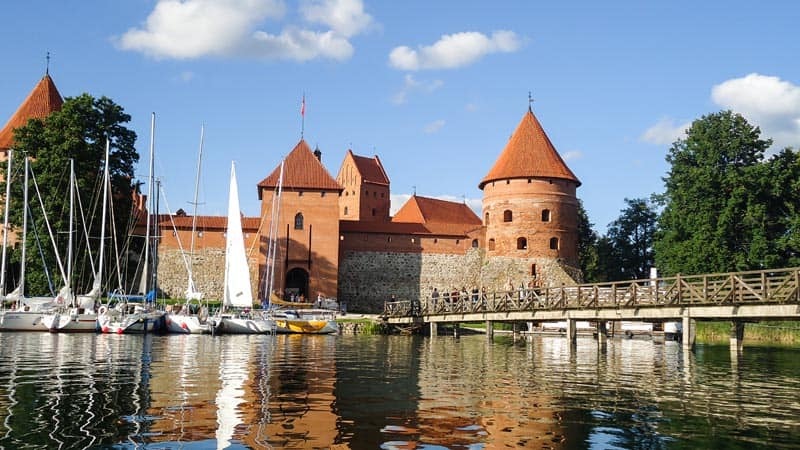 Trakai is fast becoming a popular sight to visit amongst many travellers. Located only 28 km west of Vilnius, it's within an easy reach of the capital city. Maybe not so large in size, but undeniably significant historically, the castle is the birth place of Vytautas the Great. The great man who ruled the Grand Duchy of Lithuania back in the 15th century. The sight is spectacular to view from any angel, but we suggest hopping on a boat to get the best experience. Rowing around Lake Galve is a rather fabulous way to explore the walls of the fortress. But since you made it all the way to Lithuania, why not explore in style? Imagine yourself smooth sailing aboard a beautiful white yacht. Now that's a nice way to start your adventures. The yacht usually comes with a skipper and even a photographer for all these fantastic shots, if you wish! Looking for more action? How about a river raft tour, kayaking or even diving in the lake? Sounds pretty good to us. The Historic National Park consists of 32 lakes, so the list of activities here is pretty impressive. Adrenaline junkies can join organised tours exploring the Devils Pit. It's the 8 meter deep sinkhole, often referred to as the queen of all the sinkholes in Lithuania. If that all sounds like hard work, shall we explore activities a little lighter on your feet? We hope you are not afraid of heights! 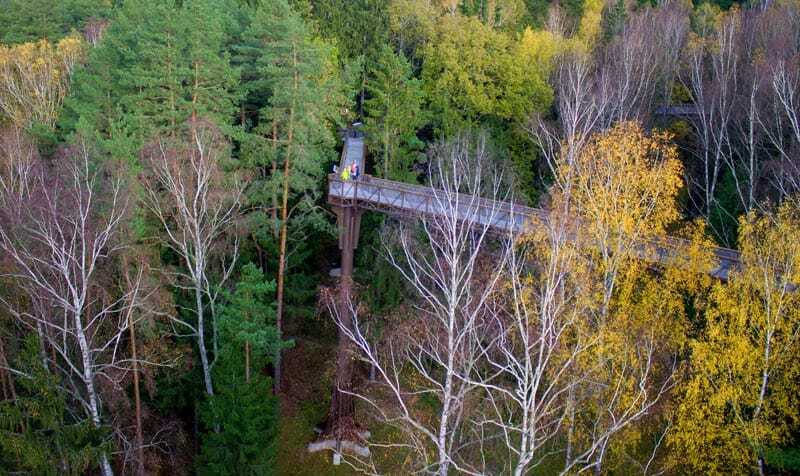 Located just a 1hr 30 minute drive from either Kaunas or the Lithuanian capital city of Vilnius, the Anyksciai Treetop Walking Path is easy to reach. It is a very recent addition to the rapidly growing list of things to see and do in Lithuania. Sponsored by the European Union, the structure is located in the beautiful national park of Anyksciai. Surrounded by the branches of evergreen spruce and pine trees, the circular walk stretches for 300 meters in length and culminates at the viewing platform 35 meters above the forest floor. The treetop walking is maybe not the most active, but definitely a picturesque activity. Furthermore, the path has a wheelchair access, which is still a real rarity in the country. And there's even more to this lovely regional park! There are many routes throughout in the forest that can be explored in many ways. You can trek, hike, cycle or simply walk, it's great! The park has even put together a handy guidebook free to download. 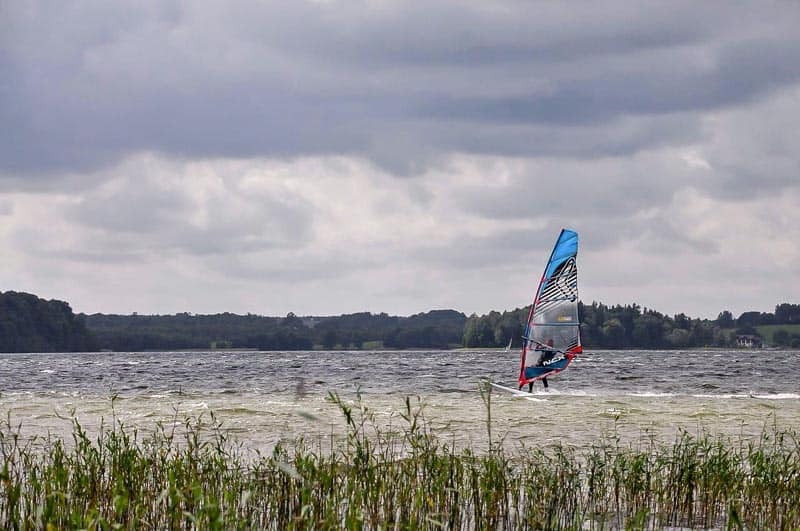 Lake Plateliai, the biggest water reservoir in the lowlands of Lithuanian, offers the perfect playground for many water activities. But the exhilarating ‘riding on water' activity remains the main focus area here. 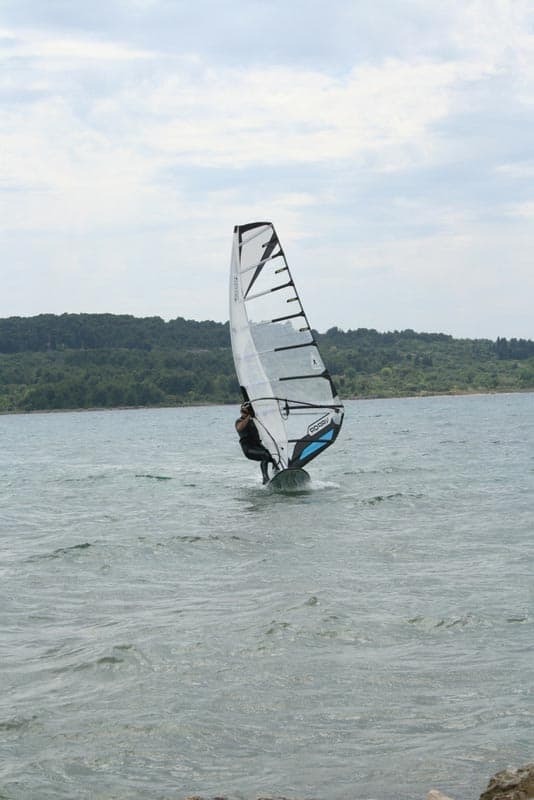 Windsurfing has been crafted in this scenic spot since 1951 when the original yacht club was established to promote the sport. From the early summer months until the first cold bites in late autumn, the club attracts all professionals, amateurs and wanna be YouTubers. 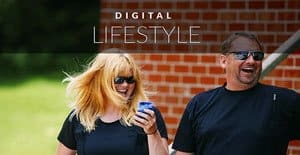 The latter live broadcasting their great Lithuanian outdoor adventures to the rest of the world. Today the club, complete with a hotel and a guest house, attracts many visitors from all over the country. Families, outdoor enthusiast and couples seeking a romantic getaway, flock to this truly beautiful nature park. You will see locals swim in the lake in summer months and lunch at the designated picnic areas. Some will arrive later for a soulful sunset and a hearty BBQ. 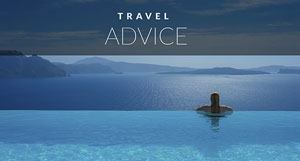 Apart from windsurfing, diving activities, yachts, kayaks and pedalos are available onsite. Or maybe you are interested in a fishing trip? And lastly, to unwind, soak your sore muscles in a steamy sauna. The sauna was great wasn't it?! But there's one more thing we bet you didn't expected to be included on this list of Lithuanian outdoor adventures.. It's time for some skiing! Lithuania is a very flat county. Therefore, skiing might not always come to mind when thinking of Lithuanian outdoor adventures. But winter activities come natural to many locals since it can get pretty cold and snowy here. That's when the fun really begins. So, If you are heading to Lithuanian in winter, you should check out Utriu Village in Klaipeda. 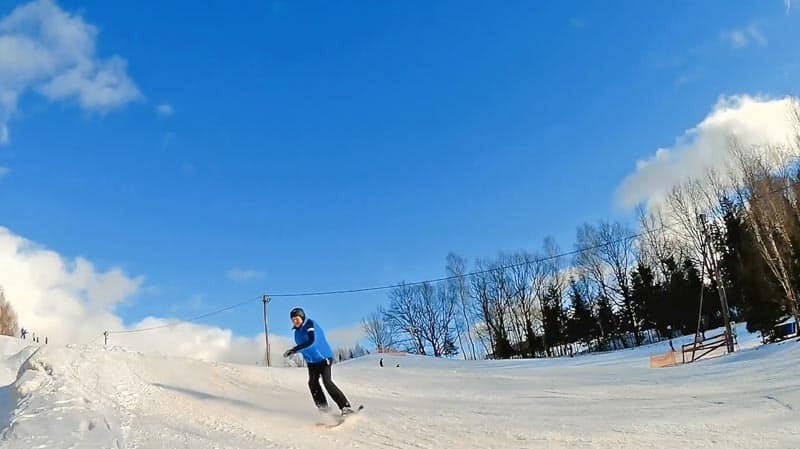 This off the beaten path spot is the only such skiing park in the region. This is not your usual skiing resort, but a clever, manmade funfair for skiing aficionados. 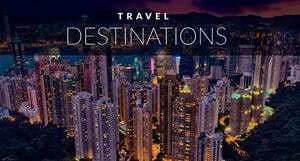 Be sure to check it out when looking for unique experiences in the western part of the country. Impressively, the modern skiing park, complete with skiing tracks and cable cars has been developed by the local volunteers. A lot of work went into developing this fantastic ‘snow zone'. You've got to admire the locals for all the efforts to enrich the lives of the residents. The skiing grounds today accommodate children, beginners and skilful skiing buffs. The dedicated staff are always onsite, making sure the snow hangout runs smoothly. The only downside of this kind of activity can be the lack of snow. But otherwise, what a fun place! How are you feeling about kayaking in a fast flowing river? Can you dodge all these obstacles coming your way? Don't worry, it's not that extreme really! Although it can get rough in places, just so you know. Lithuanians seem to have taken big interest in kayaking in the last few years. Where a river runs, there will be businesses promoting activities in the river. Rivers Minija, Žvelsa, Akmena, J?ra are just some of the names to look out for when planning your kayaking adventures. Minija is the biggest river and the most praised for its beauty in the region of lowlanders. Adorned with wonderful scenery, it is also a popular routes amongst kayakers. Organised tours will guide you upstream via some wonderful scenery and picturesque villages. The organised routes start from 2-3 hours to 3 or even 8 days long! This is depending on your fitness level, of course. So which activity sounds like the most fun to you? Let us know in the comments below! Hi, we’re Charlie and Kristina. 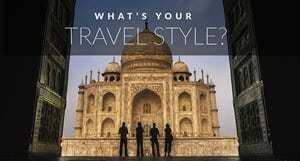 We love travel and started our travel blog Maptrotting.com to inspire you to Experience Your Planet! During a 2 week trip to Cuba in 2015 we had an honest chat on the beach one night and decided to change our lifestyle to one of travel. We soon realised it wasn’t just the rum talking and made a plan to quit London and set off on a lifetime of travel and adventure. We’re still going! 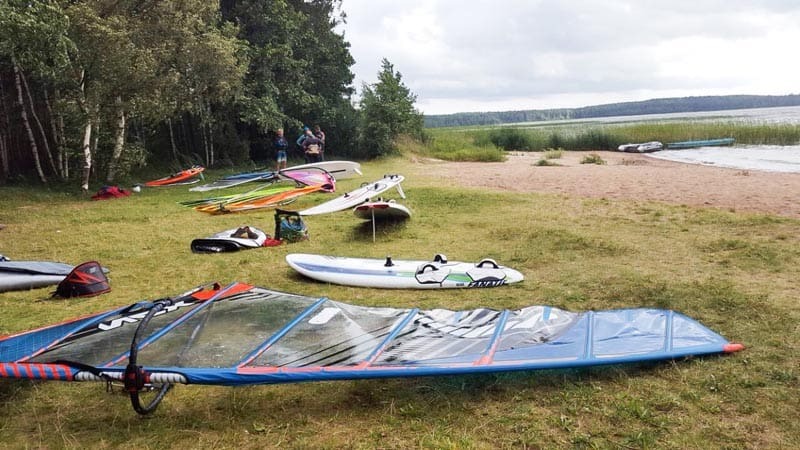 6 Responses to "Lithuanian Outdoor Adventures: Top 5 Insider Picks"
Kiteboarding and snowkiting would be my choices! This is great adventure! This look amazing pictures in your post. Thanks for sharing it. Lake Plateliai is my number one definitely- but all of those places look great. This looks like a lot of fun! Especially the castle sitting!